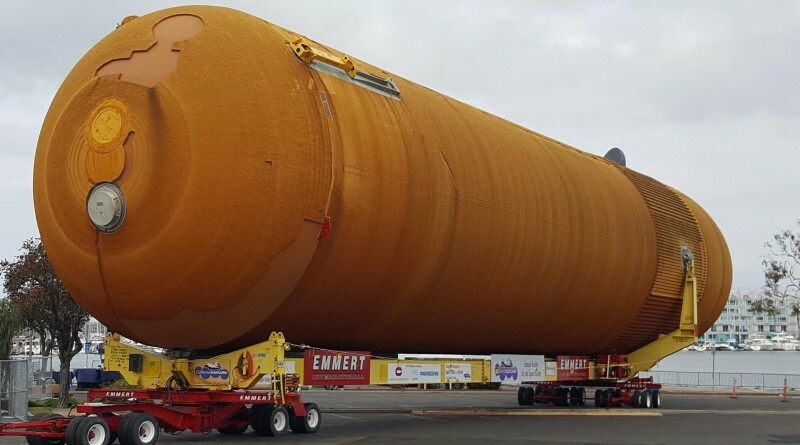 NASA’s space shuttle external tank (ET-94) made its way from New Orleans to California on the barge, Shannon Dann. The barge Shannon Dann was in the right place at the right time last month as the vessel took part in the rescue of four men whose boat sank off the coast of Baja California. The tank was in the area because it was transporting NASA’s space shuttle external tank (ET) from New Orleans to California. According to media outlets, the anglers were on the charter fishing boat Maximus when the boat sank in the Pacific Ocean. Shannon Dann’s crewmembers dispatched a life raft to the men and brought them aboard the towboat. Now the towboat was not only transporting four anglers to San Diego, but also the 154-foot-long, 32-foot-wide ET-94. The rescued anglers were dropped off in San Diego, according to news reports. ET-94, or external tank no. 94, was processed through U.S. Customs in San Diego before making its way to Fisherman’s Village where it was offloaded to a truck and transported to the California Science Center in Los Angeles where it will be on exhibit to the public. ET-94 is the last remaining external tank that was built for flight but never used, according to the California Science Center. ET-94 traveled more than 4,400 nautical miles from the Michoud Assembly Facility in New Orleans, through the Panama Canal and up the Pacific Ocean to Marina del Rey. The tank was transported by truck from Marina del Rey to the California Science Center in Los Angeles. For more information on ET-94 and the California Science Center visit californiasciencecenter.org.